Add a sparkle to your beautiful smile! The natural ageing process and your day-to-day lifestyle, particularly smoking and regular consumption of coffee, tea, or wine can have a heavy effect on your teeth. Our teeth whitening treatment removes unsightly stains from your teeth, improving the colour and overall appearance of your teeth. Bright white teeth can help you look years younger and adds a sparkle to your smile. We begin by protecting your gums prior to the application of the teeth whitening gel. Next, a blue light is shone over the mouth to optimize the gel’s effectiveness. The procedure should take no more than an hour and a half (so you can go straight back to work or your daily routine with barely any interruption). For a few days after the treatment, your teeth may feel sensitive. Drinking through a straw and avoiding excesses of temperature can help minimize this. Sensitivity will reduce overtime. The impact of the teeth whitening procedure should be noticeable immediately. The results will vary from person to person, depending on the level of discolouration of your teeth. The results can be permanent as long as a regular hygiene routine is followed. The procedure normally takes 30-60 minutes. 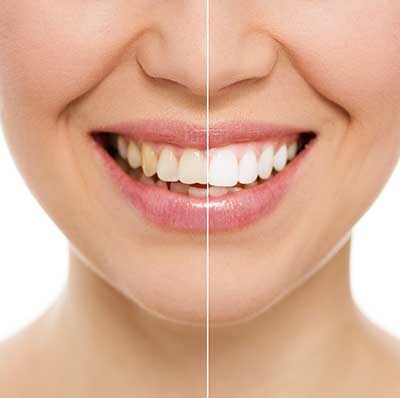 The effects of teeth whitening are very much dependent on the care of your teeth after the procedure. If you look after your teeth and avoid teeth staining food and drink (such as coffee, red wine), it can be up to a year before you require a further treatment. Following the procedure, your teeth can be very sensitive, however this normally diminishes in a few days. Most clients only require one or two sessions. You can go back to normal activities the same day. Though we recommend you avoid very hot or cold foods for a week after the procedure. You should avoid smoking and teeth-staining food and drink for a week after your procedure as your teeth will be more prone to staining. No, tooth whitening is the only way to substantially whiten your teeth. “I was always apprehensive into anything cosmetic as i was always scared of going to the doctors/nurses. However my opinion changed after attending a session with Nu Cosmetic where i recently underwent teeth whitening treatment. I was recommended to undertake this treatment by a family member and after convincing myself I decided to take a plunge. I made an appointment in their Liverpool Clinic for the morning slot and was made welcome as soon I went in. I was attended by one of the co-ordinator and was taken to the treatment room where I was asked to fill out a form by one of their clinical team. Afterwards, Sarah (Nurse) explained me in details about the treatment. I was assured all along and within an hour whole treatment was finished. Afterwards, results were amazing and i could not believe it myself. I started realizing I should have done this before but it’s better late than never. I was also given aftercare instructions which included not to drink any red wine or tea and coffee. I think this was the worst part as it was hard to keep my hands off from the wine bottle that too in the festive season. Any form of cosmetic enhancement is very personal, so prices are bespoke dependent on your individual needs. As a rough guide, you can expect to pay from £99 onwards .